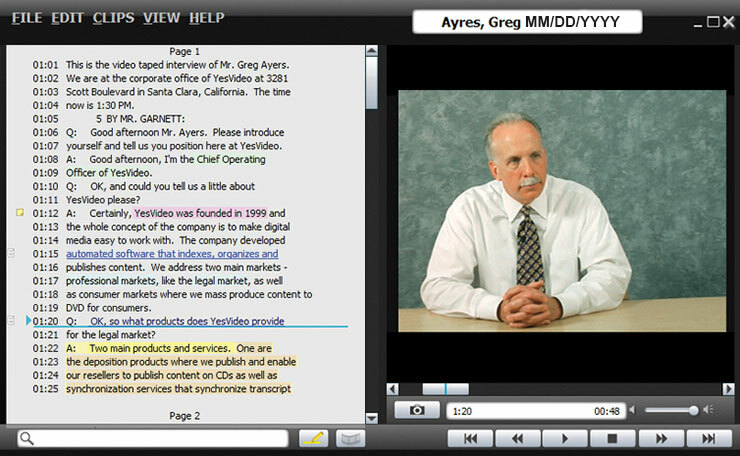 Mike Mobley Reporting’s synchronized video software allows clients to view the video footage of a proceeding while simultaneously reading the transcript on screen. Clients can search the on-screen transcript for important words and immediately see, hear, and read the relevant passages on the monitor. Combining the searchability of a transcript with the exactness of video, synchronized video allows attorneys to quickly review hours of testimony or immediately locate and present key portions of evidence at trial. The software requires no installation and is automatically included on the synchronized video media (CD-ROM or DVD-ROM) at no extra charge. The software will run automatically upon inserting the disc in any computer running Windows.